mid-air report just before the deadline. The male grouse that have been looking for love for months finally hooked up or gave up. We’re not hearing their drumming call in the forest anymore. Way to go, or sorry, guys. usual. I’m wondering of this will become more common as the globe heats up. could have been measured in milliseconds. And when they do chow down on a former colleague, do they think “this tastes just like me”? The surviving seven are comprised of three of the original flock and four of the new girls. however, saw right through this shameless power grab and sent her packing. get out an open gate. It feels neighbourly, nonetheless. worked quite well. 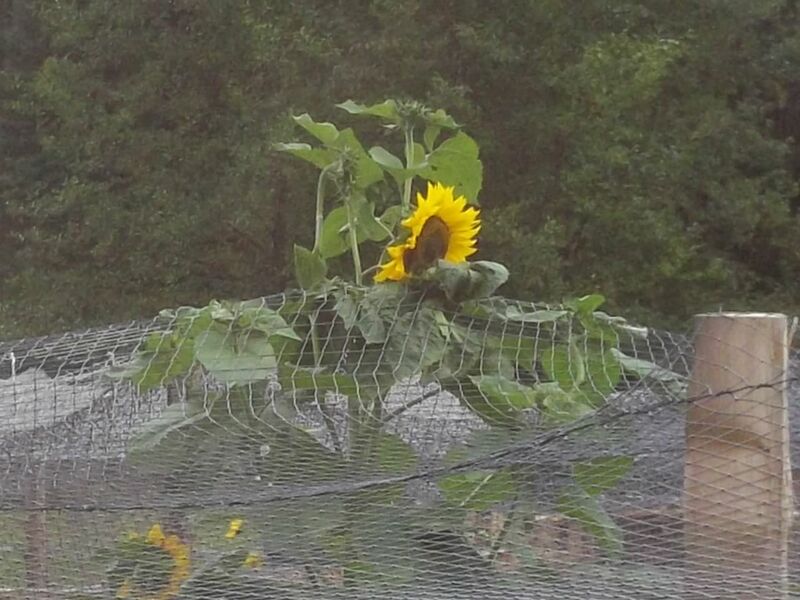 However, it did not deter this sunflower from getting out. It’s that beaver-bottom soil, don’t you know. The sunflower is a volunteer. We’ve also got a volunteer squash plant that’s looking more and more like Audrey II from Little Shop of Horrors.